Veterans Day is set aside to thank and honor living veterans who served honorably in the military both in wartime and peacetime. There are many ways to celebrate, like attending community parades and programs. Another way to give thanks is to use your sewing talents to help serve our veterans. Read on to find a list of organizations that need sewing help to give back to our vets. And don’t forget to say a big “THANK YOU” to a veteran today! Sew Much Comfort is dedicated to providing adaptive clothing free of charge to military hospitals. Hospital gowns are the only clothing available for many service members, and can be drafty and sometimes impractical for help in healing. By creating custom adaptive clothing, Sew Much Comfort hopes to make recovery more comfortable both physically and emotionally. Volunteers help create and adjust adaptive clothing from either store-bought garments or create them from custom patterns designed by Sew Much Comfort. Find out how you can help by visiting Sew Much Comfort. Quilts of Valor has a special mission to cover all combat service members and veterans with comforting and healing Quilts of Valor. 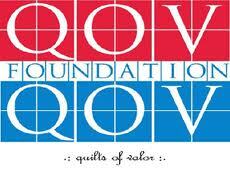 You can find free quilt patterns and even written instructions for a patriotic “Red, White and Blue Strip Quilt” if you would like to create a quilt to donate, or you can find an established QOV group and join as a volunteer. Get started by visiting Quilts of Valor. American Hero Quilts started with one woman’s determination to help injured soldiers in military hospitals with a quilted “hug” of appreciation. The AHQ website asks for help from long-arm quilters and from quilting groups of friends or family to help sew quilt blocks, tops, or bindings. 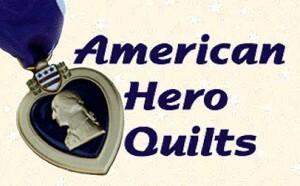 Read more at American Hero Quilts, or visit the AHQ blog to keep up with AHQ current events. The Blankets of Hope mission is to create unique, handmade blankets to send hope, support and gratitude to America’s wounded and veterans. Soldiers’ Angels volunteers help in a variety of ways from making no-sew blankets to joining the “Sewing Team” to help create blankets or simple “Patriot Pillowcases” to help raise the spirits of wounded soldiers and veterans. Learn how to help at Soldiers’ Angels Blankets of Hope. If you love the patriotic sewing machine embroidery design at the beginning of this article, check out the Americana 3 Design Pack #12203 from OESD at Embroidery Online.